Is Carbon Capturing the University? This blog was authored by Caroline Burney, a fourth-year student at Washington University in St. Louis. 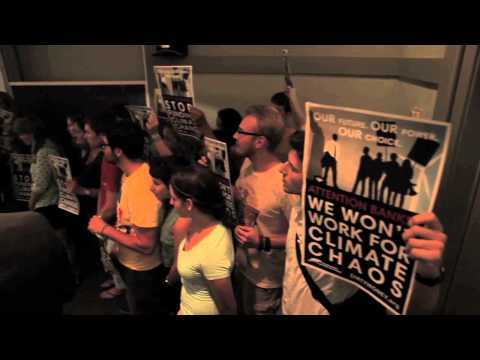 On a Thursday in September 2013, 35 students at Washington University in St. Louis marched into a Bank of Ame Wash. U. students disrupt Bank of Aerica recruitment, Sept. 2013rica recruiting session and participated in a ‘die-in’ to demand that the bank cease its funding of Mountaintop Removal (MTR) coal mining. This action called out the bank for funding the destructive process of MTR, as well as for funding the coal industry, producing to climate instability. The coal industry is dependent upon banks like Bank of America, which underwrote $8.8 billion for the worst-of-the-worst coal mining and coal-fired power companies since 2005. Just as the coal industry is dependent upon the banks to support the continued extraction of coal, so is the coal industry dependent upon universities to prop up their image and maintain their role in society. At Washington University, where I am a student, the CEOs of Peabody and Arch Coal, two of the world’s largest coal corporations, sit on the Board of Trustees. Through the industry- funded Consortium for Clean Coal Utilization, the University propels the notion that coal can be ‘cleaned’ through research and the development of carbon sequestration. The University legitimizes the activity of the industry and perpetuates the notion that ‘scientific’ research and ‘technological’ progress will solve the world’s problems. In other words, the university props up corporations like Peabody and Arch and justifies the continued extraction and consumption of dirty fossil fuels. As industry inserts itself into Washington University by sitting on the Board of Trustees and funding research, the university takes on a political stance in favor of the continued reliance on dirty energy forms like coal. The politicization of science occurs, as research represents not the best interests of society, or even the university, but the best interests of big industry. The capture of Washington University by the coal industry is symptomatic of a greater crisis: the ‘carbon lock-in’ of fossil fuel and the deep entrenching of corporate interests within society. Achieving a more sustainable energy future, free from the devastation, the pollution, and the greed of the fossil fuel industry, requires unchaining ourselves from the binds of industry. In order to maintain their power, in order to maintain their bottom lines, industry interests have captured private and public institutions, like banks and universities, to distract from the irreparable damage that they have imposed upon society. Fighting this carbon lock-in means detangling our institutions from the influence and the power of the fossil fuel industry; it means divesting university endowments from the fossil fuel industry; it means demanding that banks cease funding mountain top removal coal mining. Chipping away at one of the most powerful industries in the world requires targeting them at all of their points of influence. In examining Washington University, how can we claim to be a university that prides itself upon a commitment to global health and sustainability, while the coal industry is still actively entrenched in our institution? It is the role of students to demand that the university abandons its ties to the coal industry and takes meaningful steps towards creating a healthier and more livable planet for all. We build power against the coal industry by targeting them at every place they’re at, including large banks like Bank of America who provide critical sources of funding for the industry. If we are serious about ending Mountaintop Removal coal mining, and limiting the power of the coal industry, then we must cripple their power within society and demand that institutions examine who they are working for: large coal corporations, or the people? Click here to tell Bank of America that you won't work for climate chaos.